► Second. Album. Is. Done. A couple of studio days on November 2nd & 3rd, plus another mix day were enough to finish the record, which is now away for duplication. Eleven songs were mastered, with the hope of getting at least ten I was happy to release, but I ended up liking them all enough to put 'em out. This Telecaster to the left is a beaut. It's modified with a Seymour Duncan Hot Rail at the bridge, and a Gibson Humbucker at the neck. It's never been with me to Italy, so I only get to play it when I'm in N. Ireland. There are loads of guitar parts on songs like "Greatest Revival", "Something To Begin", "Destiny Does The Splitstep" & "Someone Gotta Hold" that were finished off with it. Anyway "Postcards..." is the result of three years work and hopefully y'all like it. I'm happy with how it sounds. ► All The Different Formats. 1) To the right is our USB FlashDrive Discography, which not only contains this new album, but also our entire release history including singles, and the first album "21st..."
All the releases are included in both MP3 & FLAC. It's £10. 2) The CD Digipak version is £10. 3) The Digital Version (MP3 320k) is £5. 4) Lossless FLAC & WAV. If you want physical lossless files, the USB FlashDrive is the best deal. Also there's the CD Digipak. If you want to download Lossless files digitally, there's bandcamp. I was working out some guitar parts for "Destiny Does The Splitstep" in this video. Got a Vox AC-30 jacked up loud in the other room. Then some of the studio master of "Greatest Revival" at the end, as a cow licks the glass. She was watching TV through the window for two days. Justin Wayne invited me on Episode 313 of his show to talk all about the new album & stuff. You can hear it after the Gig Guide on the link. Thanks to him and his co-host Claire for that. 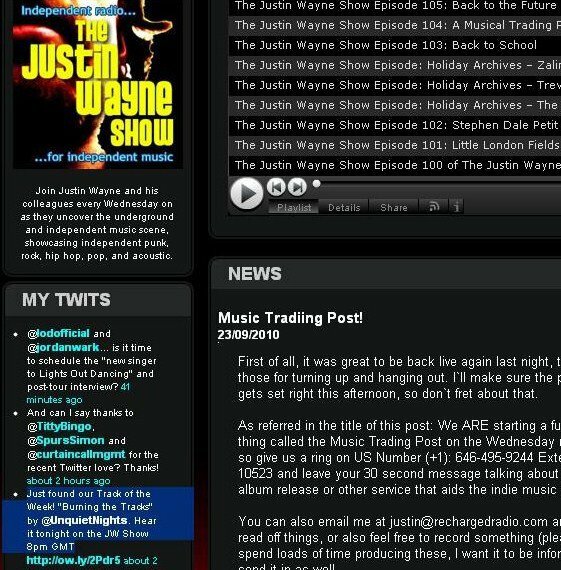 On the left is a screen grab of a September 2010 episode of The Justin Wayne Show where "Burning The Tracks" was the show's Track of the Week. That was the first song Unquiet Nights put out, and which everything sprung from. It got us on Absolute Radio, and BBC Northern Ireland soon after. You could say that Justin's support on his show was an important early boost for us. I meant to mark the 5 year anniversary with a slide show of photos showing our evolution, but that's not together yet. Below is he, I and his delightful wife after the Scala London gig in March 2011. Genuinely touching to see people using George Best City to remember the 10th anniversary of George's death, as I saw many examples of like here, here and here. The song was released in January and continues to be used by a wide range of people to remember George. 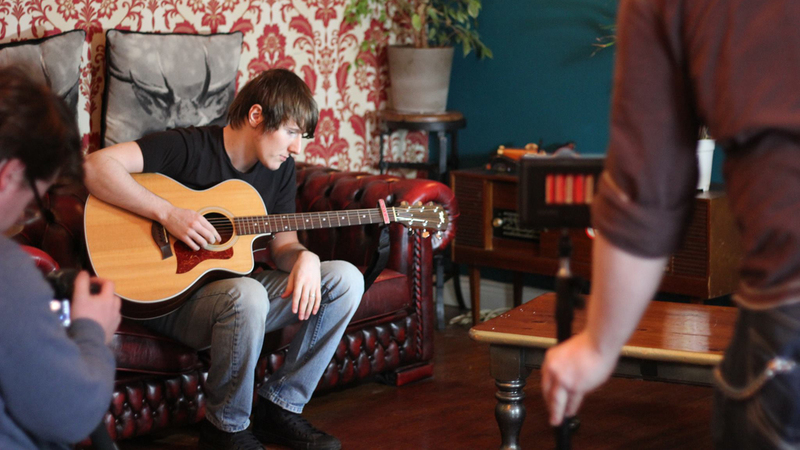 Got invited by Roadie TV to The Hudson in Belfast to record a 3 song session for them. I did "More Than These Eyes", "Constellations of She" & "George Best City" from the new album. Thanks to them. The Whelan's gig in Dublin was cool, played a bunch of the new songs. It actually involved a weird coincidence too. A Canadian couple we're friends with who put us up during last year's Indie Week in Toronto were in Dublin for the U2 gigs and were able to show up to my gig. Much fun was had there. Got some decent audio of the set too, which is coming soon.